Rainforest Jasper tumbled healing gemstones. The coloring on these varies quite a bit with shades of green being the most predominant. Rainforest Jasper brings courage and the ability to protect ourselves through change. It breaks through our emotional barriers so we can process changes and still progress forward. Size: 1 inch, some slightly larger. Stimulates visualization of this life and past life scenes. Promotes awareness of the beauty of the Earth. Aids in the ability to visualize and meditate, stabilizes creativity and brings new ideas for artists, can open artist blocks, aids in drawing and painting. Encourages change. 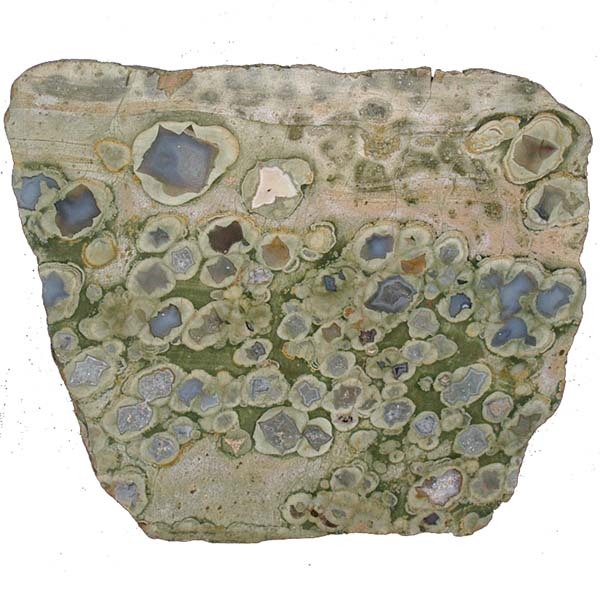 Rainforest Jasper has a Trigonal crystal system and is formed in a secondary manner. It is in the mineral class of oxdies in the Quartz group. Basically, Jaspers are fine grained Quartz that contain a host of foreign materials. When the original silicic acid solution penetrated clay or sandy rock, loads of suspended particles permeated the solution. When the silicic acid solidified into quartz, these fine particles stay trapped which gives Jasper its opaque coloring and this is the reason geology lists it as formed in a secondary manner. Rainforest Jasper could also be correctly identified as Rhyolite. They have separate trade names due to their difference in color and where they are found. The all green variety of Rhyolite come from South America and areas in Scotland. This variety now called Rainforest Jasper comes from Australia. The beautiful reds and yellows come from iron that was added to the mix before crystalizing. I feel a very strong earth connection with Rainforest Jasper. It reminds me how we are all connected to Gaia, our Mother Earth. Every plant, mineral and animal. Meditating with this one, you may recall your purpose for being here on earth at this time. And, perhaps it will encourage enthusiasm for the healing of your environment... as well as bringing you personal healing. Rainforest Jasper provides a balanced approach to pursue our spiritual goals with determination. It provides insight into our subtle energy channels and allows us to reach a state of joyful knowing. 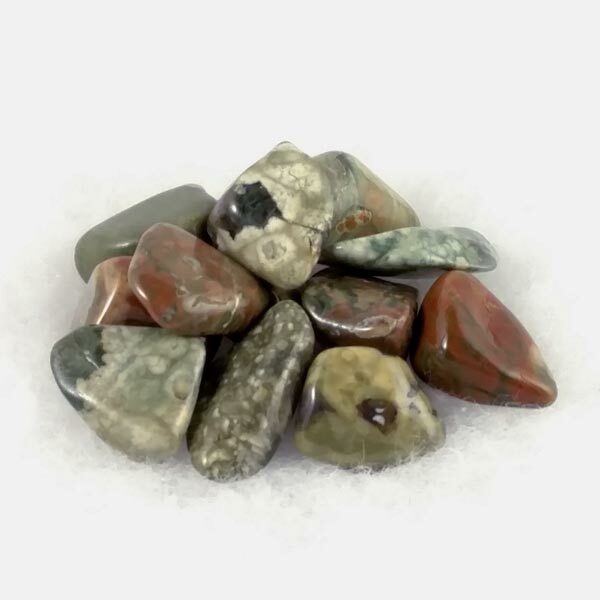 Rainforest Jasper is a good detoxifier and anti inflammatory stone, and it provides some resistance to environmental stresses (pollution, toxins, radiation). It also aids in helping to assimilate B-complex vitamins. Rainforest Jasper has a special affinity with Taurus and Virgo. Its Energy is Receptive, its planet is Venus, and its Element is Earth. This stone has been used as a healing amulet and/or health talisman. Use green candles ringed with Rainforest Jasper for healing and good health spells.